New York-based poet, singer and performance artist Jane LeCroy excels in this full-length poetry collection, Signature Play, an exquisite book of her lyrical work, paired with music by Tom Abbs, her partner in the experimental music group Transmitting. The work is lively, contemporary, strong, feminist and fragile at the same time, and sheet music included with the book makes for a unique mix of media. QR codes connect the user to listening and viewing and portals, and the book also features a mix of LeCroy’s collages and other art. 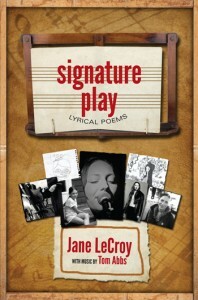 LeCroy breathes essence into a wealth of topics, discovering spirituality and animal passion in poems that flow with rhythm and heart. With or without the music, the word play is delightful and always fresh and thrilling. Jane LeCroy is a New York based poet, singer and performance artist, home-birthing mother of three, teacher, atheist, vegetarian, televisionless, hedonist who has collaborated, performed and toured with: the SF-based all-women poetry troupe, Sister Spit; the 1990’s emo-core band, Vitapup; the electronica project, Somnaut; the a capella hip-hop beatboxing orchestra, Nu Voices; and Brant Lyon’s, Hydrogen Jukebox. She fronts the avant-pop band Transmitting, featuring multi-instrumentalists Tom Abbs and David Rogers-Berry. Jane teaches and publishes student work through the artist-in-the-schools organizations Teachers and Writers Collaborative and Dreamyard. Jane’s previous book of poetry, Names, was published by Booklyn as part of the award winning ABC chapbook series, the latest Transmitting record is Dark and Full of Life on the European label, Delphy Entertainment Rekords. Tom Abbs studied jazz performance and compo-sition at the New School in the early 90s where he met Jane while she was at Lang a few blocks away. He spent much of the 90s playing bass around NYC and doing artist residencies in the public schools. In 1998 he founded the not-for-profit Jump Arts, which presented musicians, poets, painters and dancers in performance spaces around New York and the eastern seaboard. He later went on to be the General Manager of the legendary Rock and Jazz label ESP-Disk and is now co-owner and CEO of the record label Northern Spy. Tom has played on over 40 albums on bass, tuba, cello and other assorted instruments and is a current member of the Hungry March Band and Transmitting, with Jane LeCroy and David Rogers-Berry.